2040.png​ (200.5 KB) - added by duvi 3 years ago. I was just about to write that every time this happens, my laptop doesn't transmit anything anymore (although it stays connected), and I have to disconnect and reconnect to be able to use the network again. I'll compile and test right away, thanks! Getting this message in the logs now, any suggestions? Based on the forum discussion ( ​https://forum.openwrt.org/viewtopic.php?pid=202225#p202225 ), that error was with 36655, before the fix was implemented. So, probably the ticket should still be left "fixed". You might test my 36656 build and see if the error really was fixed by r36656. Seeing these on TL-MR3420 trunk r39586 in routed client + ap mode. Nnot sure if it's new or old error, I haven't used STA+AP config for a long time. It seems to only happen when the device is in STA+AP mode simultaneously, I've never seen these in AP only mode. The symptom: after a while, suddenly there is no more traffic between my laptop and the MR3420. It shows being connected, but no traffic goes through. There is no kernel warning yet. Now I have to disconnect and reconnect my laptop to have working connection again, and this is the time when the kernel warning appears. So first no traffic, then disconnect/reconnect laptop, then comes kernel warning, but connection is fine again. The STA interface of the MR3420 stays connected to the main AP the whole time according to the logs (I see nothing related to the STA interface). I got one today on a WDS wireless repeater setup. I think it happened on both devices at the same time. Seems to be solved for me, thank you! Still getting on r40694, now with a bit more in the log. Upgraded to r40803, still the same. After a couple of hours (3:30 after the upgrade this time), no more packets pass through the connection, although the connection stays up, and other devices can still connect. On the device I need to disable / enable the wireles interface to get it working again, and this also triggers the kernel warning above. One thing I've noticed though: while streaming and playing music on this router (which makes it transmit / receive continously), my computer has never dropped the connection. Forget the second part, it has nothing to with the router's uplink interface continously sending / receiving; my laptop's connection still hung even though the stream was on. I just had time to test with r42018, but it's still the same. Although I figured out, that the hang only occurs if the main router has a special wireless config set. So my client laptops are connected to my OpenWrt box, that has a STA wifi interface connected to an ASUS RT-N10E. No wds, my Openwrt box simply creates a different subnet for the LAN side. 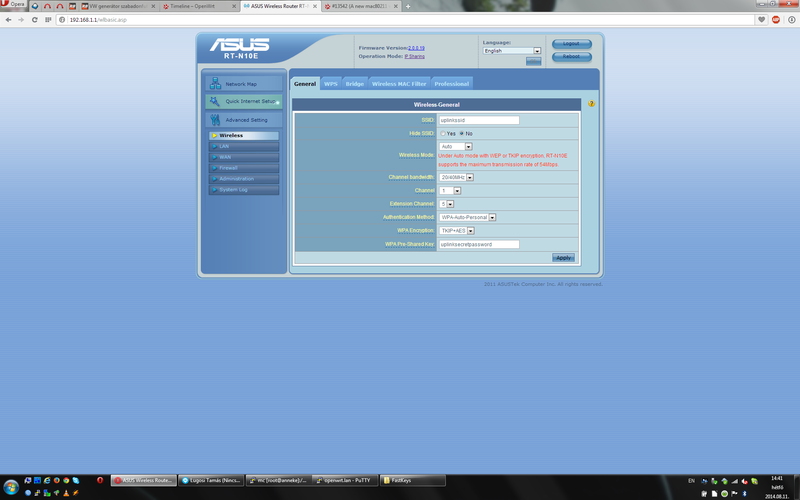 The wireless configuration of the main ASUS router is attached as a screenshot. The setting on the ASUS router the "triggers" the hangs on my repeater is the Channel bandwidth setting. If it is set to "20/40 MHz", the errors reported above start happening on my repeater, and my clients loose their connection from time to time (this is explained in my previous posts). However, if I set the channel bw on the main ASUS router to either fixed 20 MHz or fixed 40 MHz, I see no errors in the log, no connection drops, no hangs of my laptops. Can this info help to solve the problem? Tried trunk r43087, but it's still the same. Laptop in use drops the connection after a while, but the SSID stays up, and other devices are still able to connect. Connection also stays OK between repeater and main router. Any news on this? I'm having exactly the same problem in AP+STA mode. The problem randomly occurs and I have to restart my radio for the PC that lost connection could generate traffic again. This using AP+STA. When it happens, the device remains connected but no more traffic is ever generated so I have to manually reconnect it. I must add to my last comment that it only happens with HT20, HT40+ or HT40-, never with NOHT. (Or at least, not thus far).